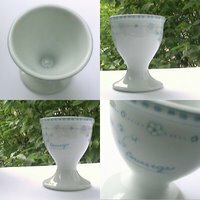 Egg cup collectors and specialists usually refer to single footed egg cups as "common shaped". 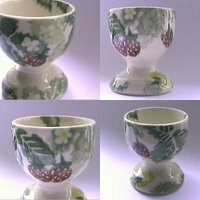 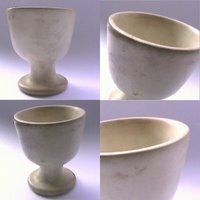 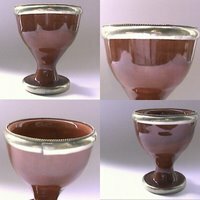 Cup, foot and base are the three main parts of this type of egg cups - if the foot is missing and, therefore, cup and base touch each other, you can call the egg cup's shape "European" instead of "common". 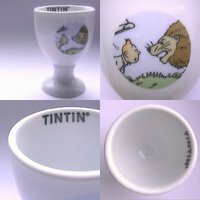 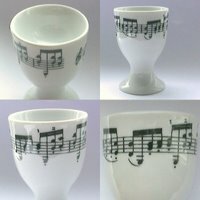 This doesn't mean that you won't find "common shaped egg cups" in Europe. 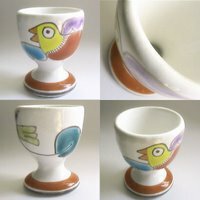 Actually, "common shaped egg cups" typically abound in all times and styles, as well as in all places, including Europe. 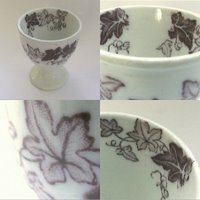 Of course, the fact of having a "common shape" is not an obstacle for them to develop their own personality: the material used, the colour, the decoration (i. e., hand-made or with a transfer picture) will contribute to define it. 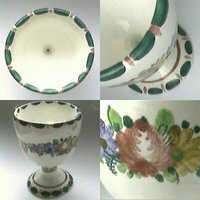 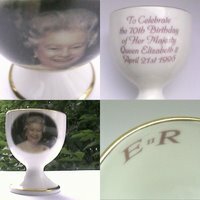 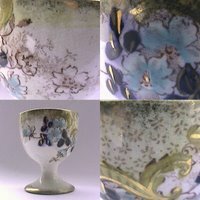 Known details: 1) hand-painted, probably Austrian [eggcup0805]; 2) produced by Bridgewater (United Kingdom), includes inside painting [eggcup1314]; 3) with metal border [eggcup3687]; 4) created by André Courrèges for Porcelaine de Paris (France) [eggcup3469]; 5) hand-painted, DeSimone studio (Italy) [eggcup3431]; 6) made in Germany [eggcup4809]; 7) Cocoon egg cup, produced by Luminarc (France) [eggcup1563]. 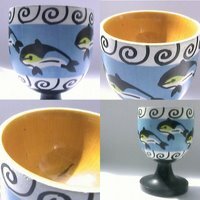 If feel like seeing more "common shaped egg cups", you could check this truly elegant Empire Work's one from the Porcelain egg cups selection; this highly tactile soapstone one, from Kenya, featured in the Egg cups in unusual materials post; the Coronet Pottery's one, from the Famous people egg cups familiy; this wooden one with dolphins, from the Wooden egg cups category; the Pickman's egg cup featured with more Floral egg cups; or even the Tintin egg cup from the Famous characters: transfer egg cups page. 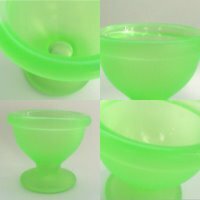 As noted, "common shaped egg cups" are almost everywhere, that's why we call them this way.